The biggest Mooncake in the Philippines is now ready to satisfy your cameras and cravings for real! Prepared by “Eng Bee Tin”, a Chinese Deli Store located at # 628 Ongpin Street, Binondo, Manila. The giant mooncake measures 75 inches in circumferencce, 24 inches in diameter, and 3 inches in thickness which can feed and be divided to more than fifty persons. This yummy delicacy is not only for display but 100% edible and made from natural ingredients. The presentation of the eye-catching mooncake was done by “Eng Bee Tin” in preparation for the Mid-Autumn Festival or popularly known as Mooncake Festival for the Filipino-Chinese Community held every September aside from giving-away mooncakes as part of the celebration. It will be on display until September 22, 2013 at SM Mall of Asia… and will also be on display until September 30, 2013 at Eng Bee Tin’s Binondo branch. 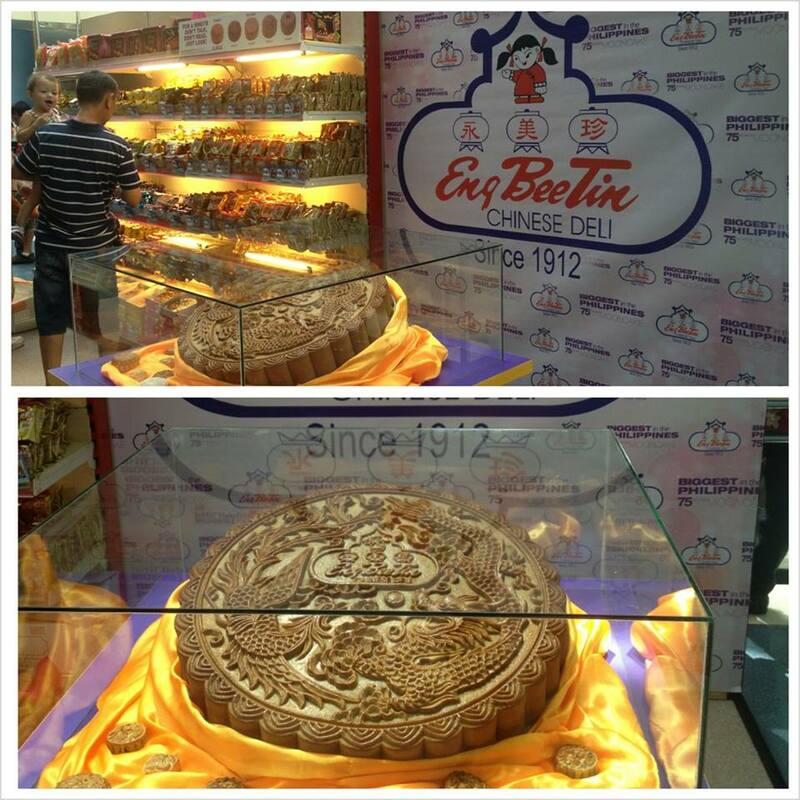 Foodtrippers and folks in all walks of life can have their photo taken with the largest mooncake for free and you can take home with you a free mooncake from the mentioned deli store if you had taken your picture with it at their main branch in Binondo. Mooncakes are made out of mixed flour and sugar, then turned into dough and added with fillings and salted eggs afterwards. Its traditional flavors are ube, pandan, mixed nuts, lotus and mongo. But now, it comes with different taste like choco peanut butter, salted caramel truffle snowskin, and rum raisin truffle snowskin. Moreover, a mooncake is more than just a food but also a part of history as it was used to carry a message of revolution of the Chinese which is the salted egg as its filling during the Civil War.